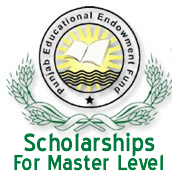 PEEF (Pakistan Educational Endowment Fund) offers Master Level Scholarships for needy and deserving candidates studying in partner public sector universities or affiliated private institutes. It is indeed a great initiative by Punjab Govt. because in public sector universities there are number of students who face financial difficulties in continuing their studies. PEEF Scholarships for Master Level facilitates the students so they may be able to continue their studies effectively. PEEF Scholarships for Master Level not only covers the 100% tuition fee of the university but also assign scholarship stipend to students to meet their other expenses that is Rs. 3000/- for day scholars and Rs. 5000/- for boarder students. This stipend would be distributed bi annually to the students. It is great help for students i would once again say because it would help them meet other study related, hostel charges and travelling expenses. PEEF Scholarship For Master Level is awarded to students who are studying in public sector university OR affiliated private institute OR a private candidates with 60% or more marks and more than 2.5 CGPA. Students who are already master or M.Phil degree holder are not eligible to apply. Further the monthly family income shall not exceed Rs.15000/-. When applying for the scholarship, you must not be receiving scholarship from any other sources. Student can apply for PEEF Scholarships in their institute, institute would proceed the application. Along with application student would have to provide the required documents and needed evidences of income etc. University/institute would provide the details of fee to PEEF. For list of partner universities, you may click here.